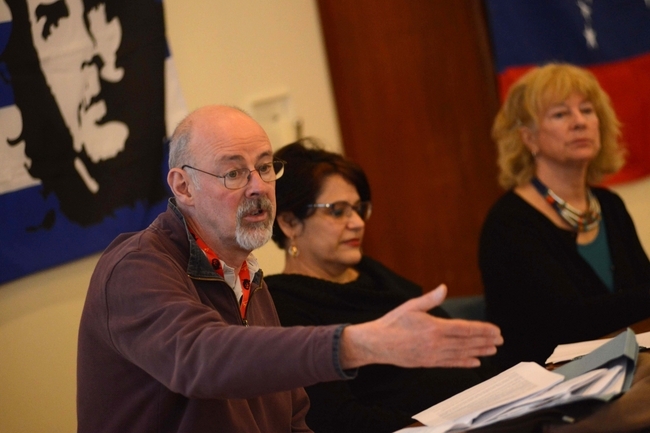 On behalf of the Executive Committee of the Cuba Solidarity Campaign and all our members and affiliates in the UK, we would like to offer our deepest sympathy to Steve’s family, colleagues and friends. Steve was an amazing friend to all the people of Cuba. He was a long standing member of the Executive Committee of the Cuba Solidarity Campaign and played a leading role in Sheffield CSC. He was also an active trade unionist within his union the UCU, (University and College Union). As a Senior Lecturer at the University of Sheffield he shared his insights and understanding of the Cuban reality with thousands of students over many years. He travelled to the island many times always meeting and learning first hand from Cubans themselves, and particularly from Cuban Trade Unionists. When he shared his understanding he made great efforts to ensure that his teaching and his solidarity speeches were clear, presented well and accessible to all who attended. Steve was a prolific writer on Cuba and Latin America. He published some wonderful books as well as being a regular feature writer for Cuba Si magazine. Yet Steve was always ready to help others and he regularly provided accessible and concise briefings, factsheets and updates on every subject around Cuba and its struggles in defence of its sovereignty, against the Blockade and for social development. Steve was a realist and he recognised the difficulties Cuba faces in building its society under the most demanding of conditions in the face of such US aggression. Yet he also saw the very best in the Cuban people and applied himself selflessly to assist them wherever he could. He chose to use his skills, and his academic status, to play an active role in the defence of Cuba and for a better world. He regularly spoke at local meetings across Britain and for many years was a key note speaker at the Latin America Conferences in London. Steve was an internationalist. He gave a home to a family of Chilean refugees following brutal the Pinochet coup in 1973, and throughout his life he maintained a close affinity with Latin America and particularly with the people Cuba where he made many close personal friends. Steve recognised the value of international solidarity and saw that Cuba offered a real alternative to the cuts and austerity led agenda which so marred the lives of millions of working people here who had seen their jobs and communities destroyed over the years. He spoke of the alternative economic model that Cuba offered. In doing so he highlighted the lost potential for our society which put profit before people and in doing so marred so many lives. Steve will be sorely missed by all of us at the Cuba Solidarity Campaign on a personal and practical level. His support, advice, clarity and understanding, has been a vital component of our work over many years that will be difficult to replace. His passing will certainly be mourned in Cuba where he had so many friends particular across the Cuban trade Unions. He was also an honorary member of the University of Havana Faculty of the Third Age where he gave lectures about international issues. The best tribute we can give to Steve’s memory is to strengthen our resolve in the struggle for an end to the US Blockade and for Cuba’s right to follow their own chosen path to continue to build their socialist society built on the principle of human cooperation and solidarity, principals which Steve supported all his life. Unfortunately, with great sadness we have received the news of the physical disappearance of our beloved and dear friend Steve Ludlam. Since his first visits to Cuba he gave himself the task of investigate deeply our process, the life of Cubans, the life of our workers, and the trade union movement. At that very moment we gave him our hand, which he never let go, and together we went through this long struggle for the defense of the Cuban Revolution, the model we chose, and our decision to defend it. He was always convinced that the Revolution was our best option, therefore, as a member of the CSC and as a friend of the CTC, of the trade unions and the workers, he worked hard in talked about and studying our system, in his University of Sheffield, that he loved too much, in events, colloquiums and other scenarios. We remember Steve as the friend who, with his tall figure, his kind conversation, with his sense of humor, his seriousness, his transparency, his humility, and his firmness, was able to tell the world our truth. He was very involved with the Cuban trade union movement, he was already part of our family, he made lectures about the Cuban trade union movement, about the opportunities of our retirees, about our challenges and about our achievements, and especially about the trust of our workers in the Revolution. Steve was an arduous fighter against the US blockade imposed on our island for more than 50 years; he was a convinced internationalist, not only for Cuba but for Latin America and the oppressed countries. The Cuban trade union movement and workers have lost a great friend, a comrade, a fighter, someone who always believed in our process, in our Revolution. Convey to his wife Julia, to all his friends and comrades and to the CSC our most sincere condolences. He will always be together with us as he was: a faithful friend, a brother of principles and of heart. School of the Third Age, University of Havana statement: On Steve Ludlam: An eternal memory for a good man. Since the foundation of the School of the Third Age (Cátedra del Adulto Mayor) at the University of Havana, we have declared 6 people as Honorary Members in chronological order: the four mothers of the Five Cuban Heroes who were imprisoned in the US, Dr. Steve Ludlam of the University of Sheffield in England and Commander-in-Chief Fidel Castro. For the School of the Third Age, Dr. Steve Ludlam has been a decisive support as a professor and social scientist, but also as a close friend, always trying to help with the needs of our program, dedicated to the education of Cuban mature students. The anecdotes and his efforts to develop our work are too many to fit in this message, but just by way of example, every year when we climb the university staircase we will see that banner donated to us by the Solidarity Campaign in Sheffield, with the colours of the University of Havana, just as we had requested. His last work with us was in the Forum ‘Your 90 years in my memory’ marking Fidel’s 90th birthday in the Sanguily theatre, where professor Steve thanked Fidel, and our city, for the chance to have understood in an authentic form the true meaning of solidarity as a human value. Steve was a friend, a great compañero (comrade), a member of the Cuba Solidarity Campaign and a member of the Committee for the Liberation of the 5 Heroes in an active and courageous way, as good men do. His last presentation at the School of the Third Age was dedicated to the study of José Martí’s ideas. He also participated in many events of the Cuban Workers Federation (CTC), the Cuban Lawyers Union and Cuba-United States Encuentros (Meetings), on issues around workers rights, as well as, in lectures against the blockade and the US naval base at Guantánamo. He had a great deal of respect for this island, and he was already very concerned about our situation in the face of the threat of the recent hurricane. He was a wonderful father always proud of his children and eternal lover of his wife Julia and his family. He was brave and upright to death when he wrote us last week in the form of a farewell. He has been an Honorary Member of the School of the Third Age at the University of Havana and as for "sus viejas", (his old ladies) as he used to call us, he will always be with us. Thank you, Steve Ludlam, for having met you and for being always ready to fight on our side, for the cause of truth and social justice. Signed: Prof. Teresa Orosa, Chair of the School of the Third Age at the University of Havana. Sobre Steve Ludlam: Un recuerdo eterno para un hombre bueno. Desde la fundación de la Cátedra del Adulto Mayor de la Universidad de La Habana hemos nombrado en orden cronológico a 6 Miembros de Honor: a las 4 Madres de los Cinco Héroes cubanos presos en el imperio, al Dr. Steve Ludlam de la Universidad de Sheffield en Inglaterra y al Comandante en Jefe Fidel Castro. Para la Cátedra del Adulto Mayor, el Dr. Steve Ludlam ha sido un decisivo apoyo como catedrático y científico social, pero también como un amigo cercano, siempre tratando de ayudar en las necesidades de nuestro programa, dedicado a la educación de las personas mayores cubanas. Muchas son las anécdotas y las gestiones a favor del desarrollo de nuestra labor y que no cabrían en este mensaje, pero solo a manera de ejemplo, decir que cada año cuando subamos la escalinata universitaria lo haremos con esa banderola que nos donó la Campaña de Solidaridad en Sheffield y con el color de la Universidad de La Habana como el mismo la mandó a hacer. Su última participación con nosotros fue precisamente en el Foro dedicado a los 90 años del Comandante en el Teatro Sanguily denominado ¨Tus 90 en mi memoria¨ donde el profesor Steve agradeció a Fidel, y a nuestro pueblo, la posibilidad de haber comprendido de forma autentica el verdadero significado de la solidaridad como valor humano. El Steve fue un amigo, un gran compañero, miembro de la Campaña de Solidaridad con Cuba y Miembro del Comité por la Liberación de los 5 Héroes de forma activa y valiente, como lo hacen los hombres de bien. Su última presentación en evento científico de la Cátedra del Adulto Mayor estuvo dedicada al estudio del pensamiento martiano y de la educación. Así también participó en muchos eventos de la Central de Trabajadores de Cuba, de la Unión de Juristas de Cuba y de los Encuentros Cuba-Estados Unidos, en temas acerca de los derechos laborales, así como, a través de ponencias en contra el bloqueo y la base naval de Estados Unidos en Guantánamo. Sintió enorme respeto por esta isla, y aun ya muy grave preguntaba de nuestra situación ante la amenaza del reciente huracán. Fue un maravilloso padre siempre orgulloso de sus hijos y eterno enamorado de su esposa Julia y de su familia. Fue valiente e íntegro hasta para morir cuando la pasada semana nos escribió en forma de despedida. Se ha ido un Miembro de Honor de la Cátedra del Adulto Mayor de la Universidad de La Habana y como decimos ¨sus viejas¨, tal y como acostumbraba a llamarnos, el siempre estará con nosotros. Gracias Steve Ludlam por haberte conocido y por estar siempre dispuesto a luchar de nuestro lado, por la causa de la verdad y de la justicia social. Firmado: Prof. Teresa Orosa, Presidenta de la Cátedra del Adulto Mayor de Universidad de La Habana.